I ran to the mall on Tuesday. This never happens. I typically don't shop your normal indoor "mall". I stick to free standing stores or boutiques. Anyway, I wanted to pop into a few stores I haven't been to in awhile; The Limited, Express, New York & Co, and Gap. Nothing dazzled me that day and I started the trek back to my car, empty handed. I parked at Dillard's and as I was making my way back through the store to leave, I strolled pass the formal gowns. I thought to myself, "I want to get dressed all fancy and go somewhere." I haven't purchased a formal gown since I was in college for my sorority. Bridesmaid dresses don't count. I spent about 10 minutes perusing the area pretending and imagining I actually had a reason to go to the dressing room and try one on. I even had one in my hand, but then I smacked myself back to reality, put it back on the rack, told myself I was wasting time and headed for the doors. Here are three that I couldn't stop drooling over. I was drawn to strapless that day. I don't know why because let's face it, I don't have much to hold a strapless dress up. Okay, this is where the story gets good weird. I have mentioned to you guys before that I have a weird sixth sense. Examples: I will think of someone and then I will see them or they will call. I will think of something and it comes true. I will dream about an event and many times it happens in some shape of form. It freaks me out and plays with my mind. Me: "Nope, not that I know of." Ross: "Well, we just got invited to a gala for the hospital. Wanna go?" Me: "Is this like a formal, black tie event?" I don't know about you, but this blew my mind. I mean, guys I NEVER go to the mall. I NEVER EVER look at formal dresses for shiz and giggles. I haven't even thought about buying a formal dress in FOREVER. I tell ya, the mind is a powerful thing. Now, if I could only predict the lottery numbers, we would all be set! Back to the mall I go, then cover myself with a self tanner and actually shave my legs. I have one day to to get this done. I am keeping my fingers crossed that the dress I love most will fit like a glove. Already stressing, but so worth it because I am going to my version of an "adult prom". Does this kind of stuff ever happen to you? If so, does it freak you the heck out? Have a super fab weekend and don't forget Super Bowl Sunday. I can't believe football season is about to be over. Where has the time gone? P.S. There is a fab giveaway going on at Glossy Blonde. Make sure to go check it out! truthfully i have kind of a weird sense too. after i think i see someone at like the mall, grocery store, etc that isn't them, within a week i actually see them! and it's like random people like from college or my hometown. so weird. I'm sure you'll look fab! Can't wait to see a recap! That's amazing! How crazy! I love that green dress! I'm going to a formal wedding in about a week and I didn't have a long formal dress! (luckily I found one at a thrift store!) But I would love to go buy a new one! Those are gorgeous! EEEEEEEEKKKKKKKK! I can't wait for photos to pop up on Instagram!!!!!! Hope the dress works out!!! Have fun at the gala - can't wait to see pics!! That is awesome. I love that first dress, which are you going to pick!? I wish things like this happened to me! Have so much fun! You are going to have the best time! My "adult prom" is tonight and I am all a twitter with excitement! Please take lot s of pics!!! This totally happens to me, and I have a hard time explaining it to people. I hate dressing up, but your dress choices are lovely and I know you'll look fabulous! Have a great time! So did you find a dress yet? I'm loving the coral and gold- with a tan that would be smashing on you! OMG that is crazy!! but how fun too! Those dresses. You know how I feel about maxi length dresses. Swoon. That is so funny. I never go to our mall either, mostly because I don't want to get mugged or shot. The mall is frightening where I live. I ventured into Dillards the other day and was scared the whole time I was there. Ahhhh! I just got chills! AND! I can not wait to see you in the dress! You are going to be beautiful!!! This does happen to me occasionally and it totally freaks me out when it does. Wow - your sixth sense is kind of awesome :) LOVE that dress with the sequin top...so gorgeous! Can't wait to see what you wear Shanna...and have SO.MUCH.FUN! Whoa. 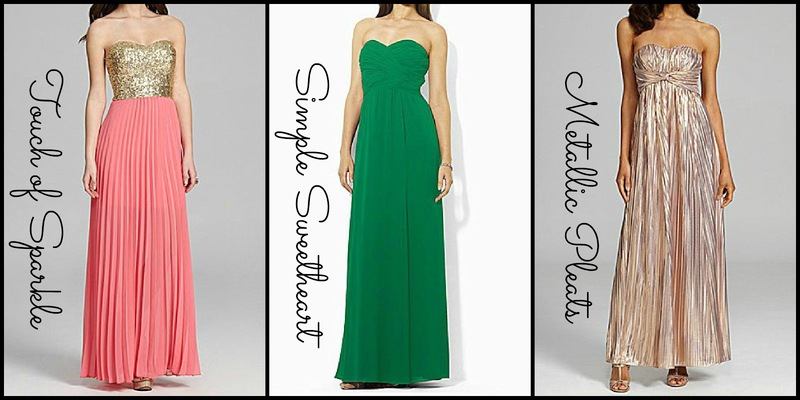 That's so crazy, but how fun that you can get all dolled up in a formal gown! Can't wait to see the final result. Formal dress shopping for your sorority?! I love you even more! I was a Phi Sigma Sigma. What were you in? PS I think my ad is finally LIVE!!! OMG. I totally have that too! I'll dream about someone and then I'll end up running into them or they'll contact me. And sometimes it is situations that I'll dream about, and then they happen. It's so erie, but I love it. I like to think that they are mini premonitions. Which one did you get?!?! I love the sparkly/coral one. That is just beautiful!!! And that is CRAZY how that happened! But awesome! I love those dresses and I'm sure you will find something amazing! This has happened to me before and it's cray cray scary! How much fun though! I expect to see plenty of instagram pics and vine vids. I know you will look fabulous! Can't wait to see the dress! That is totally weird! You are like the Texan Miss Cleo! And yay for having a reason to go buy and amazing formal gown - you have to post pictures! That's so weird! I only have the sixth sense when it's something I've lost. I dream about where it is. I LOVE the green dress. LOVE it! Let us know which one you picked and have a great time! This definitely happens to me from time to time and it does freak me out! These are gorgeous dresses. I'm sure you'll look fab! It usually happens with me in terms of songs on the radio. I turn it on and it is ALWAYS playing the song I was thinking of... weird! That's pretty amazing, how fun!! Have a ball, can't wait to see you all glitzed up;) Happy weekend!! HOW FUN! I'm jealous but I can't WAIT to see what you come up with. I will be instagram stalking you to see! Aww maybe you will get elected queen and king of the west wing! I was once tator queen you know. Have a faboo weekend. Love you! ha. I feel like that sometimes too. And as for the dresses, that first one has your name all over it! I wish this happened to me...I have great things running through my head :) I love the green dress! I can't wait to see pictures from the gala! Have a great time! I wish I did have a 6th sense! That sounds very cool. I'm looking forward to super bowl food! Have a great weekend. I never remember my dreams but when I do it's something crazy that ends up happening. that is an AWESOME story, shanna!! your 6th sense is pretty amazing- send it my way - maybe it'll help this pregnancy brain i got. I have stuff happen like that, too! It doesn't weird me out, per se, but I'm intrigued by it. And how fun that you get to go to a gala! I want a reason to get all fancied up in a formal gown, too. OMG! That is awesome timing!! Can't wait to see which gown you pick. You will look gorgeous in any of them. Heck, you could make a paper bag look amazing!! Hope you have fun at your gala!! How exciting! I was just telling my husband the other day that I wish I had an occasion to get all dolled up. I am excited to see which dress you select. I'm loving the ones you were eyeing at Dillard's. How fun to have a gala to attend! Can't wait to see what dress you choose. My husband's formal work party is this weekend but we had already planned a vacation so we won't be making it this year. Kind of bummed to miss it, but skiing and playing in the snow with the girls has been lots of fun! That green dress is beautiful! But I saw the dress that you picked on Instagram and that one looks beautiful!! Can't wait to hear about the gala, so fancy! Wow, that's so crazy! Did you go with the black and white one on Instagram? It's so pretty! Wow!!! Sounds soooo fun! The husband & I recently went to a Masquerade Gala. Which would be totally aweseome...if I had known it was a masquerade gala before we got there. Oh so fun what dress did you pick!